Looking for the DFS Glossary? It can be found here. What exactly does ADP mean again? How do I know if I’ve got a handcuff or not? My league has a FAAB; what does that mean? Fantasy football has its own jargon that owners must quickly become deft at navigating through. Aside from the abundance of nicknames for players – Dan “Boom” Herron, anyone? – fantasy football terms themselves can sometimes be confusing. Below you’ll find some common terms and abbreviations associated with fantasy football, and a quick description of what each one means. Starting simple, the following charts show the kinds of positions you might see as you sort and rank players. These are the standard symbols you’ll see when making fantasy decisions on most sites, and are the symbols and abbreviations we use here at 4for4 to make things easier. D/ST: Team Defense/Special Teams. This position accrues fantasy points based on the collective output of a particular team's entire defense and special teams. DEF: Another abbreviation for D/ST. Auction: A league where each fantasy owner is given a virtual salary cap -- typically $200 -- and players are auctioned to the highest bidder, as opposed to a traditional snake draft format. Best Ball: A league where there are no weekly head-to-head matchups between fantasy owners' teams; the fantasy team with the most points at the end of the season wins. These leagues are most traditionally draft-only leagues. Daily: A one-week fantasy contest where owners pick lineups for only one week (as opposed to the full season). These leagues usually follow a salary cap format where each player is valued according to his past performance and projected future performance. 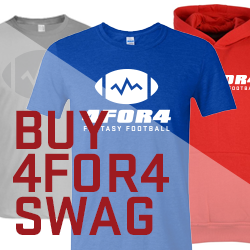 [If you're interested in daily fantasy, be sure to sign up here for 4for4's DFS subscription for the best DFS lineup building tools and content in the industry.] 4for4 also has a separate DFS Glossary. DFS: Abbreviation for Daily Fantasy Sports, or Daily leagues. Draft-Only: A league where there is no in-season roster management. Starting lineups are automatically determined by whichever players on your roster score the most points in a given week. These leagues are most traditionally best-ball leagues. Dynasty: Leagues where team owners and rosters carry over from one year to the next. Typically, owners get to designate keepers, and there is a draft for all players who aren't kept and rookies. Half-PPR: Half-Point Per Reception League. These leagues award 0.5 points per reception and otherwise follow a standard scoring format. IDP: Individual Defensive Player League. These leagues requires you to draft individual defensive players. These leagues can either entirely consist of defensive players, or require defensive players in additional to the traditional fantasy positions (QB, RB, WR, TE, K, D/ST). Keeper: Refers to a dynasty league itself. Can also refer to the particular player being kept. PPR: Points Per Reception League. These leagues award 1 point per reception and otherwise follow a standard scoring format. Re-Draft: The typical fantasy league that spans one season and no players are carried over from one year to the next (the opposite of a keeper league). These leagues are typically played in standard or PPR formats and have a snake draft. Standard (STD): Standard Scoring League. These leagues typically don't award points per reception. They award 1 point per 10 rushing/receiving yards, 6 points per rushing/receiving/return touchdown, and -2 points per fumble lost. Passing scoring systems may vary, but typically award 1 point per 20 or 25 passing yards, 4 or 6 points per passing touchdown, and -1 or -2 points per interception. Standard league drafts are typically done in snake-draft format and are typically re-draft leagues. Need player rankings for a specific league type or scoring format listed above? Subscribe to 4for4! Bench: The reserve players on your roster. Boom-Bust: A player likely to score big, but just as likely to score very small, i.e., a scenerio where the range of outcomes is volatile. Bust: A player who performs considerably worse than his ADP. Depth: The quality of your reserve players at each position. FAAB: Free Agent Acquisition Budget, a set dollar amount to use over the course of a season on free agents. Handcuff: The backup player who would start if the player ahead of him were benched or injured. Handcuffs are typically drafted at the RB position, as this is the position with the most weekly turnover. Keeper: A player retained from one season to the next in a keeper league. Lineup: The players receiving points on your roster in a given week, i.e., your starters. Price: Most commonly refers to a player's auction cost, but can also refer to a player's DFS salary, or even his ADP. Roster: All the players on your team. Scrub: A nearly worthless fantasy player, i.e. someone who doesn't play much or doesn't put up good stats. Snake Draft: The most common type of draft runs from picks 1 - 12, then 12 - 1, then 1 - 12, and so forth. Start-Sit: The decision of which player to have in your lineup, and which player to have on your bench. Stud: A top-tier fantasy player; usually among the best at his position. Waiver Wire: The pool of players available for acquisition after the draft.